Brush up on the differences between these two oft-confused solvents before tackling your next painting to-do. You might have found the perfect color, but what about the right consistency? Paint’s thickness—or, rather, thinness—is key to a perfect application. Whether you need to thin oil-based paint to pour into a spray gun or to brush on thin and even coats, mineral spirits and paint thinners are two clear, petroleum-derived liquids up to the task. Plus, they come in handy at the end of a paint job when removing this paint from brushes or rollers. But while the solvents look the same and can be used somewhat interchangeably (after all, you can use mineral spirits as a paint thinner), they’re not synonymous. In fact, they vary considerably when it comes to toxicity, odor, cost, and efficacy for various applications. 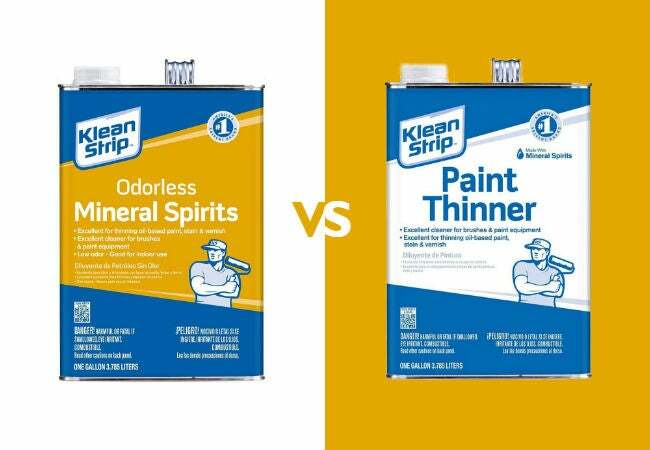 To clear up the confusion, keep reading for an in-depth comparison of the two solvents, mineral spirits vs. paint thinner. These five key differences will help you decide which product to enlist for your next paint project. Mineral spirits are less toxic. Both mineral spirits and paint thinner are created through the distillation of petroleum, but mineral spirits are heavily refined during production to reduce toxic volatile organic compounds (VOCs) and sulfur. In the case of odor-free mineral spirits, which are readily available in home centers, these toxic compounds have been completely eliminated! These solvents allow homeowners with kids or pets to rest easy knowing they aren’t introducing as many harmful pollutants into the home during paint projects. Paint thinner, on the other hand, is minimally refined during production, resulting in a solvent that retains most of its original toxic VOCs like toluene and benzene. Mineral spirits are less smelly. While mineral spirits and paint thinner both emit an unpleasant kerosene-like odor due to the VOCs they contain, the lower VOC content in mineral spirits means its odor is less potent (or nonexistent in the case of odor-free mineral spirits). Meanwhile, paint thinner comes with a more noxious odor that takes a while to air out. Smelly or not, do-it-yourselfers should wear a respirator and work in a well-ventilated area when handling either solvent since the fumes emitted by each can negatively affect respiratory health if inhaled in high enough concentrations. Paint thinner is cheaper. A gallon of mineral spirits goes for $10 on average, and odor-free mineral spirits costs on the order of $15 per gallon—nearly double the cost of paint thinner at a mere $8 per gallon. Mineral spirits require extra energy to purify and achieve s more refined content, accounting for its higher average cost. Meanwhile, the less labor-intensive production process for paint thinner turns out a less refined composition at a lower cost. Now, that cost differential may seem significant at first blush, but it’s minimal in the scheme of things. Cleaning paintbrushes or thinning paint for a furniture refresh typically requires no more than four to six ounces of solvent, so you shouldn’t need to purchase either mineral spirits or paint thinner in bulk amounts or very frequently. So, the higher cost of odor-free mineral spirits may be worth it if optimal indoor air quality is a priority for you. Mineral spirits are more effective. It’s true that both mineral spirits and paint thinners can be used to dissolve paint from brushes or rollers (simply soak the painting utensil directly in the solvent*) or to thin overly viscous paint (mix directly into the paint in the ratio of one part solvent per three parts paint). But here, too, mineral spirits is more desirable. It boasts a slower rate of evaporation; paint thinned with mineral spirits dries into a slightly smoother, more level coat on surfaces than paint thinned with faster-evaporating paint thinner. * Keep in mind that, regardless of which solvent is used, the paint should still be fresh or wet when these solvents are applied for cleaning purposes; the effect of both diminishes once the paint has dried on a brush or roller. Mineral spirits are a more versatile all-around cleaner. The purity and low toxicity of mineral spirits allow it to expand its role well well beyond a small paint job. Mineral spirits can be used to remove paint as well as oils, tar, or gunk from larger surface areas: like garden shears and saws, metal and wood worktops, even concrete floors. 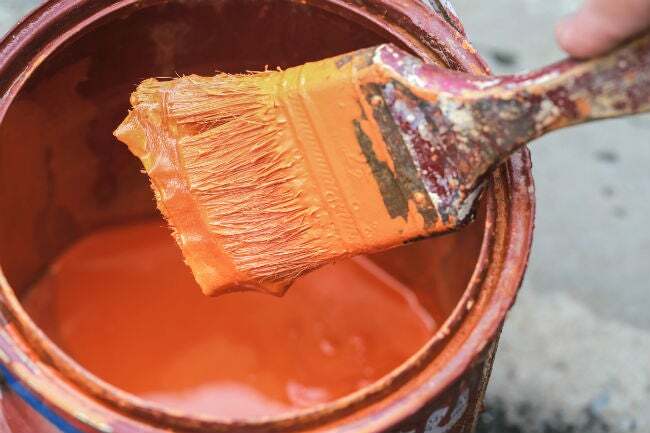 While paint thinner, too, can be applied to metal, wood, or concrete without damaging it, its higher toxicity and its emission of more noxious fumes make it unsuitable for use as a cleaner for large surface areas—best to save it for spot treatments. Neither is suitable for latex paint applications. Mineral spirits and traditional paint thinners are solvent-based (not water-based) and therefore intended for use only with oil-based paints. Using either to thin or clean off water-based latex paint might separate the paint pigment from the paint solvents during a thinning application or fail to dissolve it from utensils during a cleaning application. When thinning or cleaning tools covered in latex paint, you should instead use plain water or a specially-formulated latex-based paint thinner (e.g. Thin-X Latex Paint Thinner).